It may seem like the iPhone and its iOS operating system is dominating the market but Android phones are closing in fast, with the likes of Samsung, LG and Google Pixel paving the way. Some people may argue that the latest Samsung Galaxy S9+ is better than than the iPhone 8 in many ways but with opinion does come subjectivity. Operating on the latest Android software and with a marketing slogan that says “The Camera. Reimagined”, there’s no doubt that the Samsung team have gone out of their way to shift Apple out of the spotlight. Of course, it’s not all about being the biggest and the best. Many people buy their new mobile phone with the notion that as long as it does what they need it to do, they don’t care whether it boasts facial recognition software or the latest camera tech. If you’re looking for a good Android phone but you don’t want to part with excessive amounts of money, the Motorola Moto G6, will be more than up to the job. Whether you fancy a change or you’re a dedicated Android user, we’ve put together a selection of the best Android phones to make choosing your next mobile as easy as possible. Samsung have gone to town with the Galaxy S9 Plus and the result is a phone that is on a pedestal right alongside the iPhone 8. With the camera as the focus of their marketing campaigns, there’s everything to rave about. Featuring Live Focus and Dual Optical Stabilisation, taking professional style photos with a phone has never been more possible, while the likes of Dolby Atmos speakers, the Infinity Display screen and the intelligent face and iris scanner proving that the S9 Plus is not a one trick pony. When it comes down to it, the LG V30 boasts plenty of cool features that give it the potential to be up there with the latest Samsung phones; a large 6” display, Quad HD resolution, an intelligent camera with Hi-Fi Audio and a decent sound system. It’s operating system is older than the Samsung Galaxy S9 though, and the available RAM isn’t quite so large. The question is whether you can justify spending an additional £270 to benefit from the S9’s extra techy features and if you can’t, well this phone’s certainly a great alternative. It may not match up to the Samsung in RAM but using the latest Android operating system, it’s certainly futureproof. Google have upped their game with the Pixel 2, having put time into developing a super smart camera that takes great photos, even in low light. Google Lens enables you to learn more about the landmarks and sites that you visit, while fast charging capabilities and water resistance are certainly desirable features if you’re struggling to justify the cost of the Samsung S9+. If you’re looking for a speedy phone that will enable you to take your work with you on the go, the Huawei P20 Pro could be just the ticket. It features the very latest version of Android, plus a hefty 6GB of RAM which makes it super speedy when it comes to processing. The rear camera consists of three lenses so you should be able to catch the perfect shot, no matter the lighting conditions, while an OLED full HD+ screen means you’ll be able to appreciate the full quality of your favourite TV series while you’re commuting to work. With its hefty 6.3” screen the Galaxy Note 8 is the biggest of the bunch and rightly so, when so much of this phone’s potential lies in creating artwork. Whether you’re creating gifs, editing photos, or using the full range of brushes and pens to create amazing artwork, the Galaxy Note 8 is built for expressing on the go. Compatible with the DeX, Samsung say that this phone is powerful enough to take your work with you on the go, with its ability to hook up to a monitor, keyboard and mouse for a workstation anywhere. If you can do without all the bells and whistles of some of the phones higher up on the list and focus on in just the processing power and a phone’s ability to take photos, this one is a good buy. There’s a dual lens camera to catch the perfect shot, which is assisted by the generous 6GB of RAM and 8-Core processor. The good processing specs ensure using your favourite apps and browsing on the internet is lag free, so if you’re after a good, modern, up to date phone, the Huawei Mate will certainly be your friend. 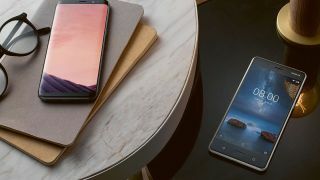 OnePlus is probably a name that you haven’t heard of before and if you’re not too fussy about being loyal to the brands, it could be worth a buy if you love a bargain. There’s plenty of good things about this phone, most noticeably, its 6GB of RAM and quality 16mp+20mp camera. With reviewers suggesting that it’s just as good as a Samsung or LG but significantly cheaper, it’s well worth looking into if you’re not scared to go off piste. Say ‘hello’ to the Motorola Moto G6. It’s cheap, cheerful and comes with plenty of specs that make it a good up to date phone. It features the latest Android 8 operating system and a decent 32GB of storage. The RAM isn’t as great as the others – 3GB means you may experience some lag on the weightier apps – but the 4000mAh battery should provide you with plenty of power for making calls, texts and internet browsing throughout the day.